Because we have so many amazing patients with unique stories, at Complete Game PT we’ve decided to feature a Patient of the Month each month. April’s Patient of the Month is Thomas. Thomas is a 12 year old baseball player who came to us last fall after suffering his 2nd incidence of “little league elbow” in the past year. 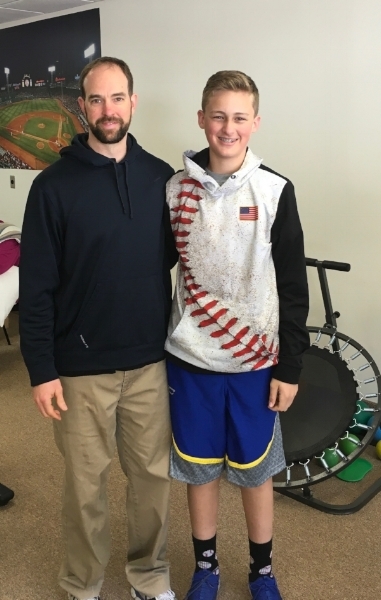 He worked with us not just to rehabilitate his elbow, but also to strengthen his shoulder and core muscles to help him reach his goals and return to his favorite sport, baseball. Thomas’s amazing recovery is due to his hard work and to the fact that Complete Game PT utilizes state of the art rehabilitation methods and clinical expertise to help him meet his goals. We were also able to work directly with his baseball coaches and instructors to make sure he was fully ready to return to baseball and make sure he uses proper mechanics so the injury won’t occur again. This has also lead to improved performance (4 home runs already this spring!). Great job, Thomas! At Complete Game Physical Therapy, we specialize in the treatment of youth baseball and softball players. If you or your athlete is experiencing shoulder or elbow pain, or you want more info on how you can prevent it call us at 978-710-7204, email me at gcrossman@completegamept.com, or browse our website. Also check us out on Facebook and Twitter for more tips on keeping yourself and your athlete injury-free. With high school baseball and softball tryouts starting this week in Massachusetts, it’s a good time to talk about injury prevention strategies. Research has shown that preseason injury rates are more than three times higher than in-season or post-season rates. Inevitably I see athletes every spring who hurt their arm or pull a muscle during tryouts. This can be a minor annoyance for some causing them to miss a few weeks, or can be devastating for others, causing them to miss a season or more. Here are a few strategies to help reduce the likelihood of injury. Show up in shape. Tryouts are not a time to get yourself in shape, as you will be doing everything you can to show your skills to the coaches to get a spot on the team. If you haven’t been exercising prior to tryouts, you will probably have a tough time. Playing other sports to stay in shape, working out in the gym or with a trainer, as well as taking some swings and fielding some balls are all important to get ready for the upcoming season. And no, playing MLB The Show on PlayStation 4 doesn’t count! Get your arm ready. Every year I have players come in for physical therapy, especially baseball players, with shoulder or elbow problems after tryouts. You need to get your arm ready before tryouts. Start out just playing catch, progress to a long toss program, then gradually start pitching if you’re a pitcher (start with flat ground pitching then build up to pitching off the mound). I know many high school coaches will use a radar gun during tryouts and I see many kids who try to throw as hard as they can for the gun. They often end up hurt and this to me is criminal. If you are not ready to pitch during tryouts, don’t - you will get hurt. Cold weather concerns. Especially here in the northeast early in the season (and sometimes even through a good part of the season) it can be quite cold. Be sure to perform a good, dynamic warm up prior to tryouts, games, or practice. Also dress appropriately, wearing layers that you can remove as you get going. These are just a few ways you can help reduce the likelihood of injury during baseball/softball tryouts this year. As the great Bill Belichick likes to say, “you can’t make the club from the tub,” which means it doesn’t do any good to just go out and get hurt. For more info on preventing injury for the upcoming baseball/softball season stay tuned for my new ebook 7 Arm Care Strategies for Youth Baseball/Softball. Good luck and have a great season! Sports Injury Risk Screening: What is it and why does my child need it? · The athlete gets injured and sees his or her physician. · The physician refers to physical therapy, recommends rest, or-in the worst cases-refers for surgical consult. · The athlete recovers and returns to sports. · The cycle repeats; injury, doctor’s office, recovery, return to sport. But there is a better way forward. Some of these injuries are difficult to avoid; contact injuries or falls for example. But many of these injuries to youth athletes are overuse or non-contact injuries. Overuse injuries account for nearly half of all sports injuries to middle and high school aged athletes. Non-contact injuries have been reported as high as 36% in college athletes, many of these being ankle injuries and ACL injuries. When you consider that over 5.5 million kids play sports in the US each year these numbers are staggering. The good news is that the likelihood of overuse or non-contact injury can be significantly reduced with proper assessment and training. Deficits with balance and lack ability to properly perform fundamental movements has shown to accurately predict injuries in youth and college athletes. Training with proper exercises to address these deficits has shown to improve evaluation, scores in soccer and football players thereby reducing their likelihood for injury. What Have We Been Doing to Prevent Sports Injuries? For years athletes have received pre-participation exams (PPEs) by their doctor prior to participating in sports. High school’s require a physical or they will not let the athlete play. There are baseline standards for cardiac health and neurologic function to allow for athletes to participate in sports, why do we not do the same for the musculoskeletal system? Musculoskeletal problems are the 2nd leading cause of disability in the world yet all that typically goes into the musculoskeletal portion of a PPE are quick screens of joint range of motion and pain. The two options we have had for youth athletes are to take what we get during the PPE or extensive injury risk screening programs. These can take up to 4 hours to complete and can cost hundreds of dollars making them prohibitive for most from a time and money standpoint. What about a quick and cost effective option to musculoskeletal screening that has shown to reduce the likelihood for injury? Physical therapists are experts in assessment and treatment of the musculoskeletal system. Testing programs such as move2perform provide us with an objective, reliable testing system that can be completed in a timely and cost effective manner. This program looks at dynamic balance with the y-balance testing system and fundamental movement capacity with the Functional Movement Screen to help identify and address deficits prior to injury. Proper assessment and adherence to neuromuscular training programs has shown to decrease injury in youth athletes. Despite these findings injury risk screening is often met with skepticism by both coaches and parents. Parents are willing to spend whatever it takes in time and money after their child is injured to ensure full recovery, but are unwilling to spend the roughly 20 minutes and minimal cost of testing to help prevent injury. The biggest predictor of future injury is previous injury; once the athlete is injured it is too late. At Complete Game Physical Therapy we are working to educate parents and coaches as to the importance of injury risk screening and help break the vicious cycle for youth athletes. We offer injury risk screening, provide seminars on injury prevention and will use this blog to provide readers with practical ways to reduce likelihood of injury. With our injury risk screening program we look to help reduce the likelihood of youth sports injury for schools, youth sports organizations and individuals. Contact us for more information on how you can get your athlete screened. For more information on youth sports statistics please visit stopsportsinjuries.org and for more information on the research that has gone into move2perform please visit move2perform.com. Was this article helpful? Let us know in the comments below and share it on Facebook! With the baseball season winding down (rather abruptly for my poor Red Sox) now is a good time to discuss injury prevention ideas for youth baseball players. Proper rest and limiting pitch counts have been talked about frequently in the baseball community and I will refer you to the following resources for more in depth discussion on those two injury prevention strategies (stopsportsinjuries.org and mlb.com/pitchsmart). Here I want to review three injury prevention strategies that youth athletes can start working on in the off season to help reduce the likelihood of injury and help improve performance for the upcoming season. 1.) Proper throwing mechanics- improper throwing mechanics have shown to be a major factor in both shoulder and elbow injury in the overhead throwing athlete. One of the common mechanical faults we often see in youth athletes is them relying too much on their arm and not using their legs and lower body effectively with their throwing. 85% of force should be generated before the shoulder. Working with a pitching coach, catching coach or fielding coach who is well versed in proper throwing mechanics is a great way to help improve throwing mechanics and reduce stress on the athlete’s arm. Keep in mind though that throwing a ball is a complex motor pattern meaning that the body needs many, many repetitions with proper form to groove this motor pattern. Do not wait until one week before the season to start working on this. Also encourage your athlete to use proper mechanics as often as possible even when playing catch in the back yard, playing with friends or warming up before practice. 2.) Proper warm up- the offseason is a great time for each athlete to figure out exactly what they need to do to get their body ready for practice or competition. Improper warm up has show to increase the likelihood for injury. Most programs will have a team stretch or warm up they use, if not you may want to see a strength and conditioning coach who can help your athlete develop their own dynamic warm up. I know how difficult it can be getting kids to practice on time but you should be sure that your athlete is never rushed and is always given time to warm up properly. 3.) Preseason injury risk screening- much research has gone into finding indicators for increased injury risk in the overhead athlete. Limitations with fundamental movement patterns have shown to increase the likelihood of injury. Strength or mobility restrictions can relate directly to poor throwing, swinging or running mechanics. Balance deficits have shown to lead to increased incidence of UCL or Tommy John injury in baseball players. Being screened for and addressing any deficits found in screen will greatly help reduce the likelihood for injury. There is no way to prevent injury but there are definitely steps we can take to help reduce the likelihood of injury. Working on proper throwing mechanics, proper warm up and getting a preseason injury risk screen are great ways to help reduce the likelihood of injury in your youth athlete and help improve their performance. We respect your privacy. We will never share your information with any third party.